Like a time capsule, unopened for nearly three quarters of a century, the music of Walter Arlen lay hidden until 2008. Full of emotional issues from a period most of us know only from history, it inevitably leads us to ask: What is the cut-off point, at which one can confidently say that Hitler's direct influence has dissipated from our emotional, cultural and musical lives? How many generations are necessary to bridge the dual states of refugee to all-American with no emotional ties to a distant country with a language no longer spoken at home. Refugees arriving with young families were astonished to see how quickly their children assimilated. Lawrence Weschler, grandson of the composer Ernst Toch, and the son of Viennese parents, has written of his incomprehension of a grandfather who was neither interested in, nor enthusiastic about baseball. Indeed, for many refugees, it was often their Americanized children and grandchildren who kept them from returning to their former homelands. On the other hand, Walter Arlen, who was born more or less around the time of Weschler's parents, became an intriguing mixture of two cultures. 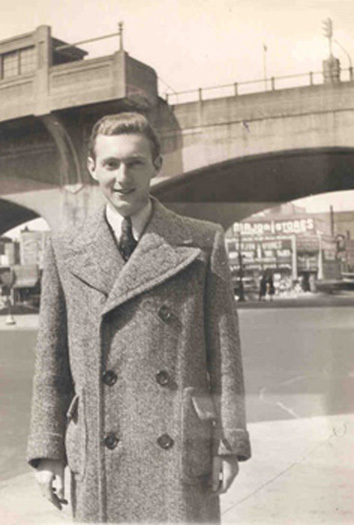 Born in 1920, he was 18 when he left Austria for America in March of 1939. His dreams of studying music had been dashed, and he was fortunate to have escaped. Miraculously, his father had been released from Buchenwald days before a visa expired, and could leave for England with Walter's mother and sister, where they arrived as penniless refugees. From Otto Erich Deutsch's pronouncement that the five-year-old Walter had absolute pitch, to spending his teen-age years larking about with best friend Paul Hamburger, who would become the accompanist and teacher of a generation of British singers such as Dame Janet Baker, the young Arlen found himself working for a furrier in Chicago in 1939. To the wrecked plans of studying composition, there followed the humiliation of the family's businesses and homes being appropriated by the Nazis, the suicides of his mother and other close relatives, the concentration camp deaths of friends and family and the separation throughout the war years from his immediate family, who remained at the mercy of London's bombing raids. After Hitler's defeat, the family was subjected to the full brunt of Austrian shabbiness in its treatment of Jews trying legally to regain what had been stolen from them: foot-dragging, stone-walling and the bureaucratic bully-boy re-possession of property damaged in the war which refugees living abroad had difficulty paying to have repaired. Destroyed not only were his youthful dreams, but also his memories of a happy childhood in Vienna and at the family's summer villa near the Hungarian border. The country that had kicked them out showed no remorse, let alone interest, in having them return. Thus unimaginable pain was heaped on top of the humiliations already inflicted. Photo 1: Walter Arlen hiking in the woods near Sauerbrunn, Austria, in 1935. 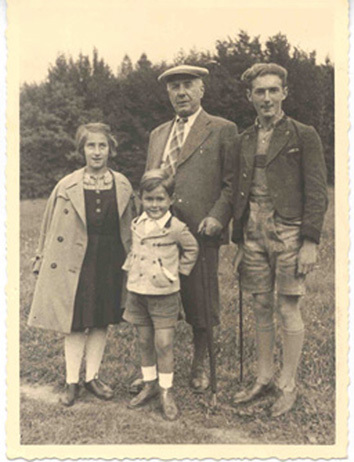 From left, sister Edith Aptowitzer (changed later to Arlen); cousin Peter Silberstein; grandfather Leopold Dichter, founder of Warenhaus Dichter in Vienna; Walter (Aptowitzer) Arlen. Through sheer talent, ambition and luck, Arlen was able to make the transition from furrier to musician. For four years he was the pupil and amanuensis of Roy Harris, one of the best known and most frequently performed American composers of the 1930s and 1940s. His musical calligraphy and fastidious inner-ear meant he was able to spot mistakes, correct and transcribe the Harris scores that now reside at the Library of Congress. From Harris he moved to Los Angeles for graduate studies in composition at UCLA and fell in with the remaining group of Austrian and German émigrés. He worked as a critic for The Los Angeles Times, founded, built up and chaired the music department at Loyola Marymount University and began a friendship with Howard Myers who became his devoted companion for the next fifty years. Arlen's English, both written and spoken, was flawless and showed no trace of his Austrian origins. He and Myers travelled widely and were welcomed into the most important circles of American and international musical life; they were friendly with Igor Stravinsky, Darius Milhaud, Heitor Villa-Lobos, Carlos Chávez and Mario Castelnuovo-Tedesco. Photo 2: Walter Arlen on a Chicago street in 1940. Yet beneath the appearance of recovery and cultural assimilation surged frustration and anger over the events of the past. Writing music, which he had done since his earliest years, became a form of therapy. In his free time after mornings working at the newspaper, afternoons teaching classes and evenings reviewing concerts, he added songs and piano pieces to the manuscripts he had kept before leaving Vienna. Most were put into desk drawers, but some received private performances by Arlen's friend, singer Marni Nixon, thanks to encouragement from the likes of Milhaud and Chávez. A series of chance meetings in 2005 led to a concert of Arlen's works at Vienna's Jewish Museum on March 12th 2008, the 70th anniversary of Austria's annexation by Germany. In attendance were the country's leading politicians along with various representatives of Exile-Music groups in Austria and Germany. Walter Arlen was interviewed between works and although performances were far from perfect, a strong enough impression was made so that his music was quickly taken up by both German and Austrian institutions. The Austrians brought him back for educational workshops, and the Germans mounted a festival with Arlen as the featured composer. A series of concerts was taken on tour and Arlen's music started to be heard in numerous cities throughout Europe. Subsequent performances took place in Berlin, Milan, Los Angeles, San Diego and New York. In 2010 the Vienna-based Exile-Music Organization exil.arte paid to have baritone Christian Immler, soprano Rebecca Nelsen and the pianist Danny Driver record a selection of Arlen's songs on two CDs to be released in 2011 by the Austrian label Gramola. Walter Arlen is now ninety years old, nearly blind and he has not composed for more than a decade. Many of the songs chosen for recording had never been heard, even by the composer himself. Although he can no longer read a score, his keen ear and crystalline memory proved infallible in spotting wrong notes and incorrectly balanced harmonies. It confirmed the degree that each work had been meticulously crafted and remained indelibly etched onto his memory. The musical language is immediate; most of the songs are poignant and many are painfully intimate. They range from the mystical eroticism of the poetry of St. John of the Cross' Five Songs of Love and Yearning, to the despair and nostalgia of displacement in the cycle of Czesław Miłosz's texts, Poet in Exile. There are songs with texts by Robert Frost, Shakespeare, Rilke and Cavafi, among many others. One, the aptly named Es geht wohl anders (Things turn out differently) was written following Austria's annexation by Nazi Germany when the composer was still in his teens; others were composed as late as the onset of his blindness in the 1990s. 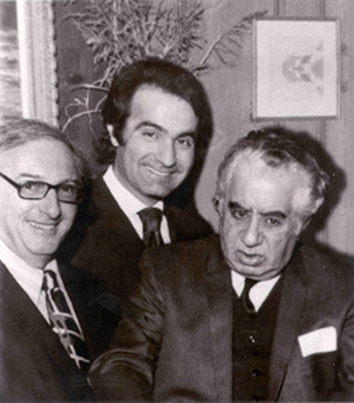 Photo 3: From left, Walter Arlen, conductor Varujan Kojian and composer Aram Kachaturian at a private home in Beverly Hills in 1974. Inevitably, another question arises: What actually constitutes an exile composer? Arlen has lived in America since his late teens. His ties to Austria exist today only through his music as he has neither relatives nor possessions in the country of his youth. Yet his music is not that of an American composer — nor is it the work of an Austrian. It is a unique fusion of the two and offers a singular expressive cosmos that is, quite literally, neither here nor there but reaches all who listen to it. Think however you like about this island, its ocean whiteness, grottoes overgrown with vines, under violets, springs. I'm frightened, for I can hardly remember myself there, in one of those mediterranean civilizations from which one must sail far, through the gloom and rustle of icebergs. Here a finger points at fields in rows, pear trees, a bridle, the yoke of a water carrier, everything enclosed in crystal, and then I believe that, yes, I once lived there, instructed in those customs and manners. I pull my coat around me listening to the incoming tide, I rock and lament my foolish ways, but even if I had been wise I would have failed to change my fate. Lament my foolishness then and later and now, for which I would like so much to be forgiven.